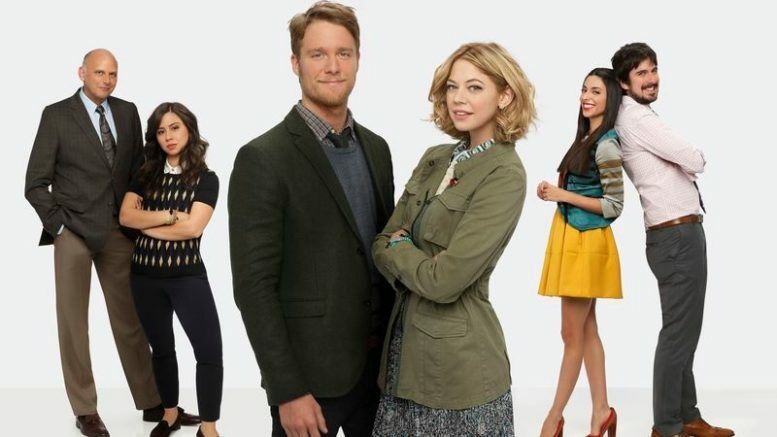 A To Z, Manhattan Love Story, Marry Me, Selfie … Broadcast TV seemed fairly awash in romantic comedies just a few weeks ago and each one promised adorable, slightly nerdy but good-looking young people in urban environments, complete with over-the-top sidekicks and cute theme music. One by one they’ve gotten the axe, with A to Z rather comically getting the bad news on the episode glorifying the letter “F” (seems about right.) What happened? First, a bit of an admission, which will come as no surprise if you’re a longtime reader: I am not a member of that 18-34 female demographic that’s so coveted by marketers, and I never have been. That doesn’t mean I don’t enjoy a peppy urban comedy, though. In fact I have watched every episode of all four of the shows I’ve listed above. Why did these shows fail? To me, they seemed like fairly reliable yuckfests, and starred some folks I already knew like Mad Men’s Ben Feldman, Cristin Milotti (the eponymous mother from How I Met Your Mother) and the always enjoyable John Cho. They showed great outdoor scenery and the supporting casts were decent (except for Parvesh Cheena who, honestly, is not a favorite of mine.) Situation comedies and love stories have been money in the bank for broadcasters for 80 years, going back to radio. I have my theories… three small ones and one terrifying one. 1. They all went after the same territory. Let’s be honest here, Manhattan Love Story and A to Z were pretty much the same show. Can you remember which one had a character named Stu? Of course not, and it didn’t matter. Once you take out the Nora Ephron-inspired vision of New York and the always-sunny Los Angeles office park, these were really, really similar. They didn’t try to compete in a time slot, but thanks to DVRs every show competes with every other show. 2. They really didn’t appeal to that target demographic. Selfie came under fire from real social media enthusiasts as being a stale imitation of what social media really is. I’ll admit it, this was a show that plays a lot better to 40-year-old men than it does to 25-year-old women. There are a lot of greybeards out there who would love the opportunity to impart their wisdom and life choices to a young, doting lady, even in the most platonic of ways. To an extent you can say the same thing about all those shows. I’ll tell you that they really did a good job of providing us GenX-ers with what we think young romance should be about, which (according to my Millennial friends) is not at all what it’s like now. 3. They went for the easy laugh. Nothing wrong with the comfort food of sitcoms, but if we want easy comedy, there’s no shortage of 1960s – 1990s content out there and most of it was better than any of these shows. Remember, this is the world of DVRs and Netflix. In a very real way, these shows were trying to compete not just with the stuff on today, but with Friends, Seinfeld, The Cosby Show, and even I Dream of Jeannie. No wonder they fell short. The failure of these programs proved that at least in 2014, the easy laugh can be the hardest thing to get. The people in these shows don’t watch TV. I’ve said it before in another editorial. Young, urban Millennials are increasingly inclined not to watch live TV. They’ll stream stuff when they have time, but the idea of sitting down for appointment TV is foreign to them. A TV show about urban 20-somethings is going to fail because the target market isn’t there. This is a massive threat to the broadcast industry and the fact that all of the major networks were (to some extent) unable to see this is terrifying. There has to be some serious handwringing at all of the broadcast networks right now. It’s not just that these shows flopped — a lot of shows don’t make it past the first year — but it’s why they flopped. The very future of broadcast TV is up in the air if the networks can’t figure out how to lure people under 35 to the TV every night. It’s never been a problem before, but this generation grew up for the very first time with a massively entertaining, always-on, easily pocketable source of information. It could be decades before we understand the impact of the internet on our future evolution, but one thing’s for sure, it affects the way we want to be entertained. In 1970, a rather obscure song came out called “The Revolution Will Not Be Televised.” It actually is fairly decent poetry (read the lyrics here) although most folks, ironically, will need Google to understand the pop-culture references. The song was right… the revolution will not be televised, but not because it’s taking place on the streets; it may just not be televised because television may not survive to see it.